Right on the border between Arizona and Utah, lies a vast region with a plethora of sandstone rock formations, known as Monument Valley. The scenery is easily identifiable – the movie set for many Hollywood western productions and blockbusters such as Back to the Future III and Forrest Gump. Today, this region is inhabited in majority by the Navajo Native Indian tribe. This tribe made history in World War II, as the Navajo language (due to its uniqueness and complexity) was adopted for radio communication by the US forces. The Valley was the first overnight stay on our 2-week US roadtrip. Naively, we did not make any hotel reservations, thinking perhaps that there would have been plenty of last-minute accommodation available in the area. Much to our surprise this wasn’t the case; in fact, we realised at 11pm that not a single room was available within a 2-hour driving radius! After many failed attempts talking to Booking.com operators and researching online, the front-office manager at the Hampton Inn felt sorry for us and suggested that a friend of hers might have a room for the night at her B&B home. In a scene that resembled nothing less than a move thriller, we drove to the Navajo reservation camp at midnight, in the middle of a rain storm. Looking back through the rear-view mirror, I could see the sign of worry drawn on everyone’s faces, as we drove in muddy roads through a bunch of old trailers and makeshift shacks. Worry turned quickly into a smile and a sigh of relief, once we were greeted by a friendly Navajo lady, who welcomed us in her pyjamas to her recently renovated home. After giving us a short tour, she mentioned that she had to leave early in the morning to go to work. Worried not to wake us up, she politely asked us to leave the money on her kitchen table and lock the door behind us on our way out. She had known us for less than a few minutes, yet she was kind and courteous enough to treat us like family – a trait that one doesn’t come by often and a gesture that I will never forget. Shot with my tripod mounted Canon 60D and my Sigma 10-20mm F4-5.6 DC HSM lens, at ISO 100, F8.0, at 1.6 sec, exposed at (-2/0/+2). 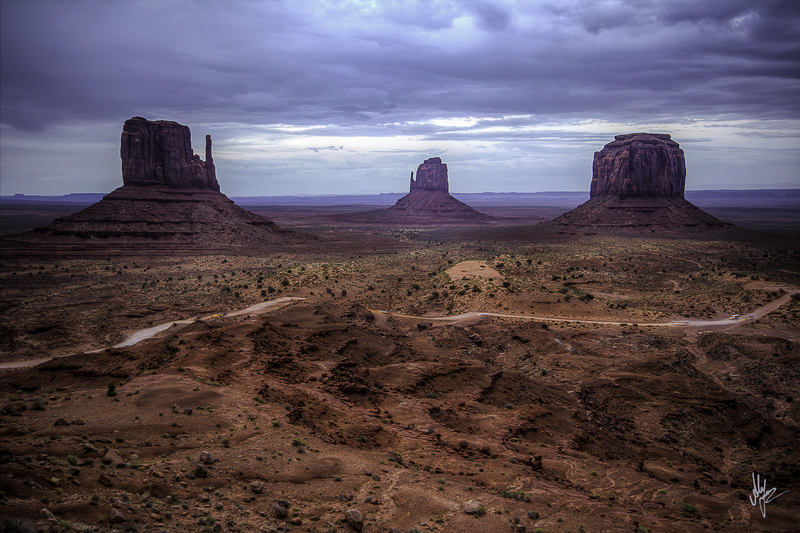 This entry was posted in My shots and tagged alexis thomas, Arizona, Landscape, monument valley, Navajo, photography, Roadtrip, rock formations, Sandstone, tribe, USA, Utah by Alexis Thomas. Bookmark the permalink.